The Childcare and Protection Agency (CPA) has been focused on improving literacy in children of all ages, and to further this concept, it has launched the ‘Back to Basics Toddler’s Reading Programme’ in all 10 administrative regions. Director of the Childcare and Protection Agency (CPA), Ann Greene. The Back to Basic Toddlers’ Reading Programme is an inter-agency collaboration with the Childcare and Protection Agency (CPA), Public Health Ministry and the National Library. 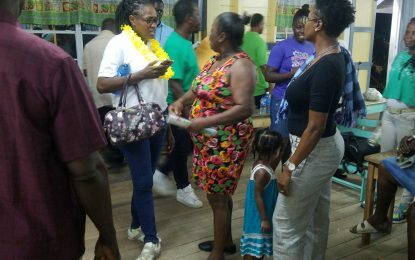 Greene explained that officers of the CPA visited with and encouraged parents to read to their children as they thrive to implement the programme. The programme is aimed at promoting early reading for children, from birth to three years of age. The director further explained that the agency supplied some of the books for the programme while others were donated. This was to ensure that each toddler gets a book. The Back to Basics: Toddlers’ Reading programme is expected to be established at over 300 health centres and 360 childcare facilities across the country. The childcare centres will also be required to establish a library or reading corner for the children.